Finding Nemo is the sort of movie that everyone seems to enjoy. One that has high replay value and can already be found in the movie libraries of many homes. It’s a movie about family, about being a parent, about adventure, about being lost, and about finding your way. The emotion contained within is great, and it has captured many a heart. It’s one of those movies I remember rushing out to buy when it came out on DVD, and now it’s the latest in a series of Blu-ray upgrades to my movie library. If you’d like more information about the movie itself, don’t forget to check out Episode 90 of the Disney Film Project Podcast. This release contains a lot of content, some old and repackaged, and some new. So much that it overflows onto a second “Bonus” Blu-ray - much of the original DVD Collectors Edition content can be found here. One interesting feature that can be found spanning both discs are scenes called Aquariums. They can be accessed via a menu selection or a fish symbol found on the bottom of all menus. They’re nice to watch and really show off the high definition that Blu-ray provides. But only one scene has fish in it, which I sort of felt was disappointing. Reinventing the Submarine Voyage discusses the history and recreation of the Submarine Voyage ride in Disneyland to the Finding Nemo Submarine Voyage. You get to see the creation of the submarines themselves and how they were built at a real shipyard. A look back at the live mermaids that used to swim around in the lagoon. And how they decided to close the ride until they could come up with a way to re-invent it. This was almost done when Atlantis: The Lost Empire came out, but was abandoned when the movie didn’t do well in theaters. After a nautical engineer inspected the old subs and said they had at least 50 more years of use they were re-invigorated. And how when Finding Nemo came out, the deal was sealed. You can watch via storyboards an Alternate Opening to the movie that consists of Marlin watching over Nemo as he sleeps. There’s also a piece called A Lesson in Flashbacks where Andrew Stanton discusses how his original idea for the movie was to tell Marlin’s story up until the point where Coral dies as a series of flashbacks throughout the movie. The idea is still one he hopes to use one day, but it was abandoned when it didn’t play well with audiences. On the Bonus disc you will find Mr. Ray’s Encyclopedia an interactive book where you can learn about the real life counterparts of the fish stars of the movie. In addition to a number of production outtakes you will also find a Glenn McQueen Tribute about the Pixar team member who died during the production of Finding Nemo and where Lightning McQueen gets his last name. And don’t miss the commercial for the Aquascum 2003. 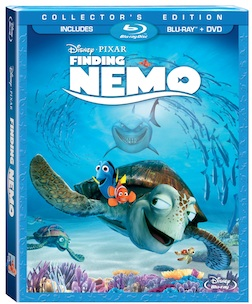 If you don’t already own a copy of Finding Nemo, but want to, this is a great release to grab a copy of. It is chock full of content that will have you watching and listening for a while. If you’re like me it makes an excellent high definition upgrade. Finding Nemo itself is just a great movie all around and you really can’t go wrong owning a copy of it. I’ve been stressed due to the holidays, so it completely slipped my radar that Finding Nemo was re-released. Now that a co-worker at DISH informed me that it was, I’ll definitely put this movie at the top of my Blockbuster@Home queue list. I like Blockbuster because I can rent games and movies, access online content, and stream movies straight to my TV. Blockbuster saves a me ton of money in the long run.